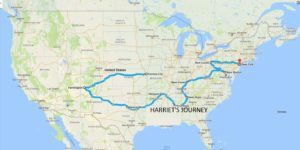 This is a fantasy story yet everyone who reads about Harriet come away with a desire to help others achieve their dreams. 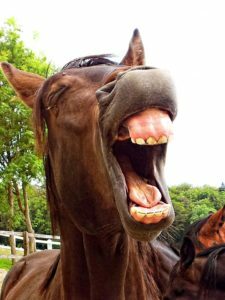 Harriet is a Morgan horse who can talk, sing and dance. She is the hardest worker and delight of the barnyard and the pride of Farmer Jones. Her ego is more than a little inflated. She yearns to go to Hollywood and become a famous movie star starting with appearing on Animal star search. Mr. Jones says he cannot spare her but he gives her perks. like wood paneling in her stall, wall-to-to-wall carpeting of hay, a color tv, stained glass window and the most interesting, she doesn’t have to work on Sunday ever again. That part makes her sad because she doesn’t think that going to church in a surrey with the Jones and waiting outside, singing along with the hymns is work. The animals understand and even though they will miss her greatly they love her so much they want to see her happy so they tell her to take Farmer John’s tractor and Donna the Donkey gives her straw-hat to stay out of the sun. All her music was learned by ear as she doesn’t read or write. She’s afraid she won’t know how to find Hollywood or where to stay. He says she can stay with his cousin in Newbury Park which isn’t that far from Hollywood. So he finds a pool of crude oil and dips a wing in and writes the word NEW onto a piece of wood. He says “Follow the road West and stop when you see the word NEW on the sign, you can stop. Can you do that?” She agrees that that’s pretty easy and off she goes. She lumbers into the driver seat and is excited to find that her ride is all front hoof drive, as her hind feet just dangle. Since Farmer Jones always called fuel hay and those who use it “a hay burner” she thinks that the tractor can also run on hay. When she can’t pay for fuel at the station she offers her services of singing and dancing to raise money for the gas station attendant. She such a success that he can retire in the lap of luxury with his wife and travel. He gives her $100 he promised if she could increase his business. She pays her 10.00 bill from that. Because he’s so busy counting his cash he accidentally points her east instead of West. 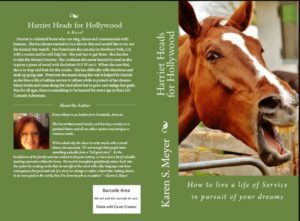 She spends the rest of her life trying to find Hollywood never failing to make a difference in the world by making lives better by her presence, but find out what happens when she eventually gets to see the bright lights of the Big Apple. A book for the whole family and a message of family values and the blessing of giving service for all. This is live on Amazon now! It is also available on Kindle and Barnes and Noble.